I will also provide a compatibility CD that will allow the game to run under ALL VERSIONS of Windows 10, 8, 7, Vista and XP, both 32 and 64 bit. Local area network multiplayer is possible but I would need to send you a simple update via e-mail. 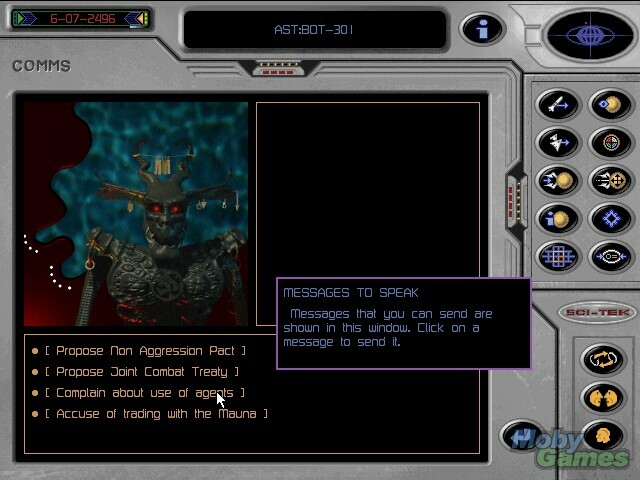 In Fragile Allegiance, a real-time galactic strategy game from Interplay, you represent the TetraCorp in its effort to colonize the galaxy and mine the valuable resources that are found on asteroids. In the process, you will meet and compete with different alien races who are looking out for their own interests. You decide with whom you wish to trade, who you want attack, and how you want to spend your hard-earned money. All the while, you are also attempting to avoid total financial and political ruin or annihilation. This is big business at its worst (or best) and the fate of TetraCorp is in your hands. The game comes complete with tutorials, 11 preset campaigns, custom games and a multiplayer option for up to eight players. The 10 tutorials step you through important parts of the game in a hands-on manner. They are a great way to learn the nuances of the game and familiarize yourself with different concepts. There are 11 campaigns, which vary in size and scope and range from small arenas with a few alien races to large games with all of the races playing. Starting small and working your way up to more difficult campaigns is a good way to get comfortable with the different features and the resource management, which is crucial to success. A custom game can be configured to have different arena sizes, asteroid densities, and varying levels of hostility. You can also include as many of the six races as you wish. The multiplayer option allows for up to eight players over a network or modem in a custom game. Once you begin a game, you will start on a single asteroid with one colonization ship. Your task is to unearth resources, build spacecraft and support buildings, and explore your surroundings. Some of the six other races you will encounter will be hostile while others desire a peaceful coexistence and trade. Information about all six races is available in the help file, including their characteristics, temperament, appearance, etc. This information can be very helpful in determining what strategy to take when dealing with another race. If you encounter someone and either do not have the desire or ability to fight them, you can offer them a contract that sets up a treaty or non-aggression pact. These include the terms of the deal (i.e., length), a penalty for breaking the terms, and other clauses. You become more successful and powerful by colonizing asteroids and mining their resources. Mining for various metals allows you to build structures, ships, missiles, and satellites. There are a large number of structures you can build on your asteroids to improve productivity, allow for an increased population, better defenses, and other purposes. The game features two views of an asteroid’s surface, one which shows all of the buildings and structures that have been built or are currently being constructed. The second view shows all of the available space on the asteroid as a grid and shows occupied spaces as colored squares on the grid. This way you can tell where there is still room to develop and can therefore better manage the remaining space. Build your structures too close together and a few well-placed missiles can wipe you out. There are several different ships you can build in Fragile Allegiance, including scouts, fighters, or transports, which can be used to inspect nearby asteroids or explore unknown areas of space, battle with enemy forces, or colonize unoccupied asteroids, respectively. Satellites can be sent to spy on neighboring asteroids and keep you informed of what is going on there (very helpful for keeping an eye on your enemy). 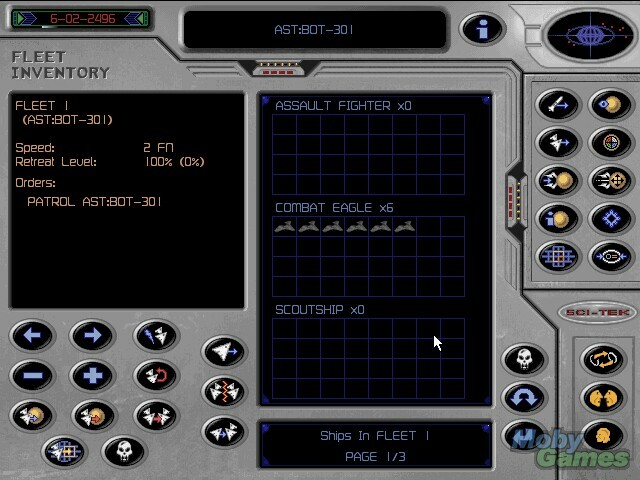 You also have the ability to build different types of missiles to send against unfriendly neighboring asteroids. All three of these types of equipment have special structures from which they are built and launched. They also have different raw materials requirements and costs associated with them. The real-time aspect of the game really keeps you on your toes and forces you to pay attention to lots of things at once. The more asteroids you colonize, the more there is to do. Fortunately, colony supervisors are available for hire to help run the day-to-day activities so that you can concentrate on developing and implementing your overall strategy. While you have to pay for them (get them from the corporation), they will manage all of the small decisions involved with running an asteroid. The decisions can be distracting and will cost you the game if you’re not paying attention to what’s happening elsewhere. If you’re short on money (which is needed to pay colony supervisors, build structures, etc. ), you can sell some of your excess metal to the corporation. You can also order special structures and blueprints for better spacecraft, missiles, or satellites from TetraCorp. Occasionally, traders will also visit your asteroids and offer to buy or sell special items to you.